This article will explore a history of women’s belts 1920-1960. Here I will showcase popular styles, materials, and the way in which belts were generally utilized and included as a fashion accessory. For a history of belts 1920-1960, read on! Whilst belts can be an integral element to an outfit, on the whole their history has remained unexplored. Entire books exist exploring the design history of various accessories: handbags, shoes, costume jewelry. Whereas belts seem to have escaped this scrutiny. Perhaps this omission is due in part to the categorization of this item. Although belts seem to be classed as a fashion accessory, they may also in some cases; due to their decorative nature be considered costume jewelry. Belts started to feature as prominent fashion accessories from the 1930s onwards. This example is from Harper’s Bazaar, 1948. Centuries ago, belts were used for their practical nature. Purses and fans would hang from belts, and during conflicts they may have been used to carry weaponry. Of course, belts would also serve the important purpose of keeping an outfit in place; whether that be by holding a waistband securely to the body, or by keeping robes together. During the 1920s, belts were usually made from the same material as the outfit it was intended to be worn with. As the waistline dropped to the hips, women wore belts on this new low waistline. Belts could be fashioned from fabric, ribbon, cloth, suede, or decorated with elaborate beading. 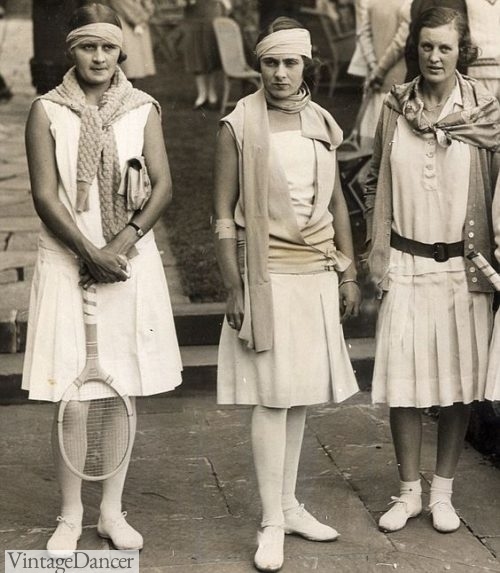 Often during the early years of the 1920s, belts were worn with sporting attire. Buckles were small, and could be made from various materials including early plastics, glass and paste. 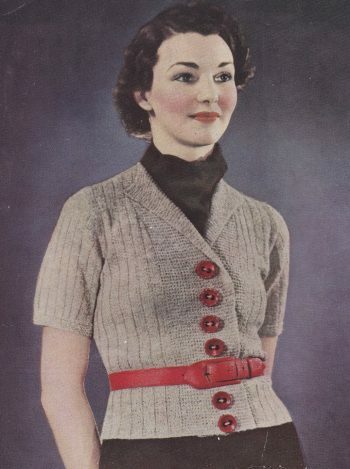 In the autumn of 1926, Good Housekeeping declared: ‘Belts are as important on morning and sports models as girdles and sashes are on afternoon ones’. A selection of belts and sashes from the mid 1920s. As illustrated in this statement, for the early years of the 1920s belts were normally reserved for more casual occasions or styles of dress – sportswear and morning attire. Alternatively for occasions requiring more formality, sashes were often utilized in place of a belt. However, towards the end of the decade, belts started to be included in evening ensembles and more formal modes of dress. This illustration from Good Housekeeping 1926 shows how belts were utilized to draw attention to the low waistlines of the period. In the 1930s, belts were frequently included as an important finishing touch to an outfit. With the waistline returning to its natural position, this allowed belts to become integral fashion accessories. Belt styles of the early 1930s were narrow, with delicate decorative buckles. During the 1930s, belts may feature feminine design details such as the pom-pom trim on this belt from 1937. During the early 1930s, belt widths were slim. The key component of the belt was the buckle, which was frequently used as a decorative feature. Buckles came in many shapes and sizes, from diamond shapes to two-part rectangular clasps. A selection of buckles and clips as advertised in British Vogue, March 1935. Designers embraced the show stopping appeal of the buckle, creating unusual shapes and styles. Indeed, Diana Vreeland wrote in her ‘Why Don’t You..’ page for Harper’s Bazaar – “Why don’t you.. order Schiaparelli’s cellophane belt with your name and telephone number written on it?”. Towards the end of the decade, belts increased in width. For daytime, suede and leather styles were common. For evening wear, belts became more elaborate as befitting the occasion. Buckles were highly decorative, made from early plastics, glass, brass, silver and paste. Popular shapes of buckle include geometric shapes – squares, diamonds, and rectangles. Belt fastenings were not limited to the centre front, belts were also seen buckled at the back of evening and afternoon gowns. Belt styles of the 1930s began to become more utilitarian towards the end of the decade. This example is from Stitchcraft magazine, 1937. 1937 wide buckle suede belt avilable in white, tan, green or navy blue. By the 1940s, belts became more utilitarian in style. Whilst day dresses often featured matching fabric belts, increasingly tougher materials such as leather and suede were employed. Due to leather shortages due to WW2, alternative materials were sought to create a similar effect. Alternative materials were sought to fashion belts during the 1940s. This example shows decorative belts made from fabric. This belt is made from hand knitted stripes, mounted onto a canvas backing. Featured in Stitchcraft magazine, 1949. Wide petersham ribbon was a durable substitute. Belts were also made from tough canvas material, covered either with decorative fabric or crocheted/knitted designs. Although belts had become wider and more practical in appearance, they may also feature unusual design details. This example from 1948 Harper’s Bazaar features a chain loop fastening. Some styles of this era incorporated additional decoration in the form of metal charms, looped and hanging from the belt or as part of the buckle. Leather belt with decoration featured in British Vogue, 1946. By the end of the decade although belts were worn on the natural waistline, their function was not wholly to nip in the waist. By creating a slender waistline, in contrast the hips may appear rounder – a silhouette that Dior championed through his New Look of 1947. A nipped-in waistline helped to create the popular rounded hips silhouette of the later 1940s. A model draws attention to her belted waist in British Vogue, 1946. Elle magazine showcases the dramatic contrast of a black belt against a canary yellow backdrop. Elle, 1948. Belt styles of the 1950s were wider than previous decades. At first, they were only 2 inches wide but grew into massive 5 inch wide bands by the middle of the decade. Wide belts were also worn in the late 40s creating a wide-thin-wide roller coaster throughout the decade. While fashion designers had realized the potential of creating matching accessories to compliment their designs, the price commanded was often too high for the masses. However, Claire McCardell worked to bring affordable designs to the fashion conscious consumer. McCardell focused on practicality, comfort, and function. One of her key accessory designs was a wide belt made from sturdy, yet stretchy elastic. They were given the name cinch belts and were made of wide elastic or fabric that either laced or clasped in the front. The cinch belt has remained the most iconic belt style of the 1950s although there use was not heavily pictured in the media, they were sold from the early years to the end of the decade. Most dresses were sold with matching or complementary color belts with squared buckles made of self-fabric. They could be made of stiff fabirc, leather or shiny plastics. The size of the buckle matched that of the dress details. Simple dresses and suits had thin belts while fancier or trimmed dresses had slightly bigger belts. In the mid 50s the squared belt buckle was rounded out around corners for a more feminine look. House dresses and informal summer dresses had the most comfortable belt, which was a matching strip of fabric tied around to the front in a bow. It was the least restrictive and most flexible of the belt style and remained common throughout the decade. Some party dresses as had this style of a belt but the fabric was more rope like and simply ornamental, not waist cinching. In 1952 the cummerbund belt was in fashion. It was another style women could make at home by pleating horizontally a few rows, stitching into a Petersham ribbon and securing it around the waist with 2 or 3 buttons (at the back.) It stayed on trend for the entire decade. In 1953, adding some dazzle to belts was the in fashion style. Beads, gems, rhinestones studded belt buckles and bands equally. In 1954, the sash became a simple alternative to a classic belt. It was a simple 6 inch strip of fabric with finished edges. At its widest it took on the shape of a Japanese obi belt. In 1957 the concha belt, or metal medallion was briefly in fashion. The trend began a few years earlier but was slow to be adopted. It would return in the late 1960s when the earthy bohemian and disco looks took center stage. Also around 1957 the skinny belt was outpacing sales of wide belts. It was only an inch or so wide with small metal buckle. It looks especially charming around sheath dresses, pencil skirts and ladies suits. It also looked nice with high waisted capri and cigarette pants that now has belt loops stitched into the band. The look was more masculine with the addition of the belt loops but the skinny belt kept it lady like as well. Swing dresses continued to be sold with narrow or wide belts and cummerbund style but there was an increasing trend not to wear belts with these fuller styles. In 1958 the sash belt returned with a single or double tail hanging down the front side. It could be self tied, pinned with a brooch or strung through a metal ring. The last year, 1959 saw all belt width worn again- skinny to wide. Newer styles had a more modern futuristic look with wide, belt buckles and grommeted holes. Belt color usually matched perfectly so not to stand out. Belts with flat bows for buckles continued into the early 60s when every dress was trimmed with a bow at the waist. In the 1960s, we see the waistline position alter. During the early years of the decade, the fashionable waistline was worn on the natural waist. However, as the decade progressed, the waistline dropped to the hips almost in a recreation of 1920s styles. Towards the end of the decade, belts fashioned from various metals were popular. Belts may closely resemble costume jewelry during this decade, with gilt chains of interlocking loops worn low on the hips. These were called Bikini chain belts and were usually worn over a bikini swimsuit or hip hugger pants in the late 1960s. Styles of chain belts, as illustrated in Harper’s Bazaar, 1966. Leather and suede materials were still popular, with buckles often large rectangular styles. The Gaucho belt of the late 1960s and 1970s was made of medaillions of leather and metal joined with a chain. It had a southwest or Spanish flair to the design. This belt featured in Harper’s Bazaar, 1968 shows the drop of the waistline to the hips. Belts were slim, made from fabrics, ribbons and cloths. Tough, durable materials are utilized – leather, suede, canvas, petersham.